If you’re a sweet potato lover and you are trying to get fit, you are in for a treat. Literally. These delicious yet easy to make pancakes are great for all of you who are looking to shed some pounds before summer knocks on your door. 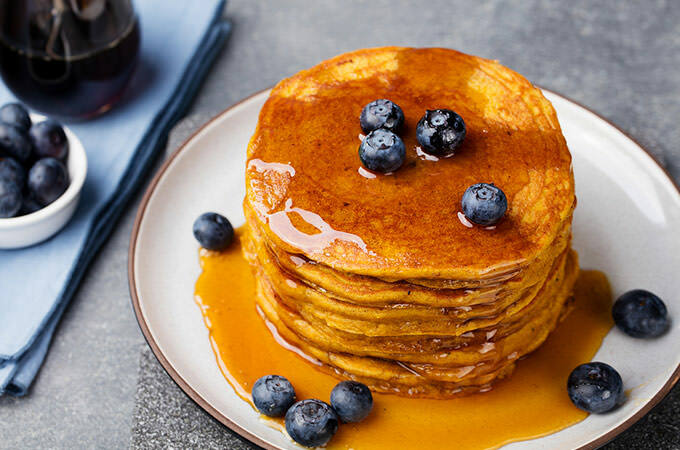 These mouth-watering sweet potato pancakes can be topped with maple syrup, honey, apple butter or applesauce. Or, you might choose not to use toppings at all as they are already naturally sweet due to sweet potatoes. This particular recipe yields 2 servings with 2 pancakes each. In a large bowl, mix all the ingredients well, but do make sure all your sweet potatoes are mashed. Cook as you would normal pancakes. However, since these sweet potato pancakes don’t “bubble” as normal pancakes do, they need to be cooked thoroughly. Since the batter tends to be rather thick, make sure you spread it out when you scoop them on the hot skillet.